For my last posting for Women’s History Month, I am leaving you with what has to be my all time favorite painting in the Worcester Art Museum. It is well worth the climb up three flights of stairs. The painting so beautifully expresses the role of women in the development of major art movements, particularly in the US. I can’t think of any group of women artists who were given fleeting mention for so long in art history texts as those who were active in the New York “School” at the same time as the “stars” who were given all the hype such as Jackson Pollock and Willem de Kooning. This artist also comes from the awesome state of New Jersey, which has given us many master artists of modernism. I give you Grace Hartigan. Hartigan was born in Newark, NJ. She took art classes at night. During World War II (1939-1945) she worked in an airplane factory, practicing her art whenever she had a chance. She became a pupil of the Newark avant-garde painter Isaac Lane Muse (born 1906). He stressed creativity over polished execution of a painting. 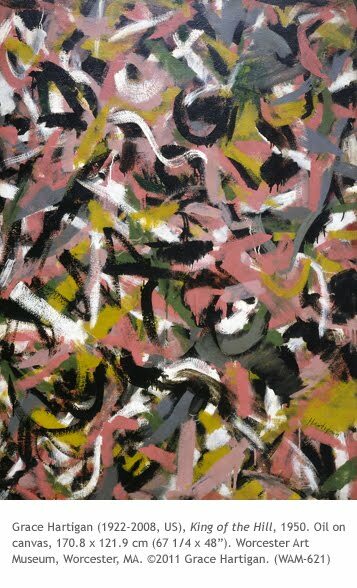 In 1948 Hartigan met Lee Krasner (1908-1984) and her husband Jackson Pollock (1912-1956), both seminal artists of Abstract Expressionism. At the time the two were not internationally known, but had already mastered the action painting style of the New York School. Excited by what she had seen, Hartigan produced paintings that were influenced by their styles. King of the Hill is a work that reflects the earlier gestural paintings of Pollock along with the energetic, expressionistic brush strokes of Willem de Kooning (1904-1997), while avoiding the “drip” idiom of Pollock. Paintings of this style were a brief period for Hartigan, because she felt it lacked a personal depth. Around 1952 Hartigan began introducing figurative and objective aspects to her paintings, while maintaining an expressive, gestural style. 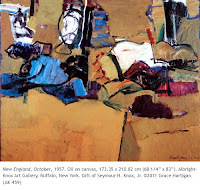 The painting New England, October of 1957 is a beautiful example of how she integrated her action painting experience into her mature style. Hartigan’s paintings of the later 1950s won wide critical acclaim. 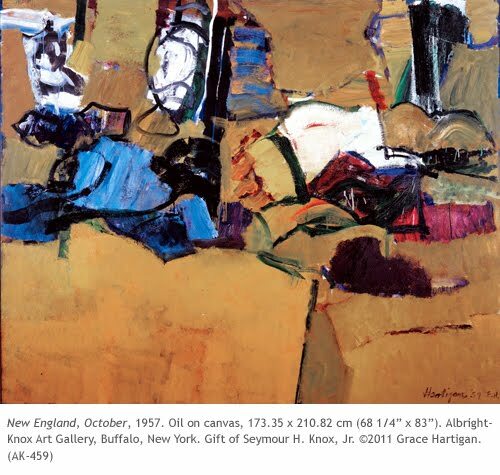 In 1958 she was the only woman chosen to be included in the Museum of Modern Art’s show “The New American Painting.” The show also featured many of the male abstract expressionists, as well as up-and-coming artists who were experimenting with color field and minimalism. The internet offers many wonderful photographs of the artist in her day with the abstract expressionists.